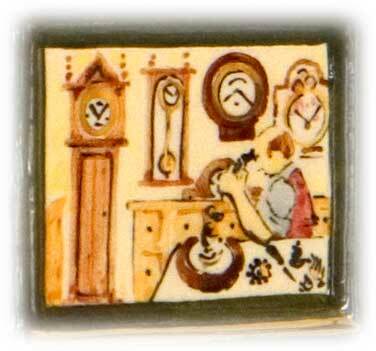 Not only does every ceramic tell a story - there is a story to tell about every ceramic! Hazle then created two prototypes with Sharon’s new window, one with ivy and another with an exterior clock. At this point I wanted to see what was happening and we also needed photos for the group. As soon as I saw the prototypes my immediate reaction was, wouldn’t the clock and ivy look great together on one ceramic! But it was late - we were all pretty tired - Carol Whaley’s husband Ian was fitting shelves in the background - and the kilns were firing making our eyes sting. So I broached the subject very gently with Hazle. As luck would have it, there was an Old Father Time sitting on the table which was painted with the new window but had no changes to the brickwork. Hazle sat down there and then and did what I’d suggested - with Chris supplying a coin from his pocket for the clock face. Even unfired it looked fabulous. Hazle expressed some concern over how this could be presented but my view was that with a better product there simply wouldn’t be a problem. And there wasn't. Behind the scenes this is the way the company always works. It is by no means a smooth slick business - but more of an ideas factory. That is how artists and innovators generally tend to operate. Artistic considerations usually win out over commercial ones with Hazle Ceramics, much to the detriment of their profitability! Members were offered the new window and foliage for the same price as the original at £84.95. On request, those who had already ordered could have this upgrade for free. The new window and foliage plus exterior clock cost an extra £5. I love the extra detail that’s been added. Please pass on a 'thank you' to Sharon & Hazle. Where else would you be offered a 'free upgrade' like that? !